The story of Keats’s illness and death cannot be told without reference to the life of Joseph Severn. Severn, an ambitious and kindly young painter, was Keats’s companion and nurse during his last months of life. And afterwards he remained a true friend, determined to enshrine the memory of Keats’s talent and courageous spirit in the popular imagination. Severn’s own behavior during those long, sad months in Rome was exemplary. He and Keats had known one another in England, but they were only passing acquaintances. Keats was far closer to Hunt, Brown, Reynolds, and Haydon; but it was Severn who agreed to accompany him to Rome when all others could, or would, not. And it was Severn who recorded the slow decline of his friend’s health and spirits in Rome, the city which was supposed to rescue his health but instead became his final resting-place. Severn was twenty-six when he accompanied Keats to Rome on board the Maria Crowther. Just a year before, he had won the coveted gold medal of the Royal Academy for his painting ‘The Cave of Despair’, inspired by Spenser’s Faerie Queen. He was from a close-knit and successful middle-class family and already popular within the artistic circles of London. He had been chosen as Keats’s companion just three days before the Maria Crowther sailed from England. And though he was popular within London, Severn was also regarded as something of an intellectual light-weight; his sunny disposition and innate cheerfulness made him seem naive and immature. In truth, he was simply a kind and humorous young man. And though he was dedicated to his own artistic career, he saw no reason to alter his nature simply to appear more ‘serious’ and ‘intellectual’. Keats’s friends did not think he would be a fit companion for the poet, lacking the personality to support such a gifted and brilliant man. But a more perfect companion than Severn cannot be imagined. As all of Keats’s friends would readily admit years later, his care for Keats revealed hidden depths of strength and substance in Severn. I should mention that Keats’s last weeks in England were spent in Kentish Town, in rooms found by Leigh Hunt and paid for by Charles Brown, but many of his afternoons were spent walking the Heath with Severn. Keats’s increasing melancholy, created by his illness and jealous brooding over Fanny Brawne, was evident but did not disturb Severn unduly. He certainly felt comfortable enough to later accept the position as companion. Keats’s closest friends were unable to accompany him for various reasons. Leigh Hunt, with a tubercular wife, several children, and a mountain of debt, had perhaps the best excuses. Most others were worn down to a repeated mantra – they were too busy to take six months or more out of their lives to accompany Keats to Italy. Severn, though not a member of the intimate circle of Keats’s friends, was still well-known enough to be mentioned as a potential companion. Also, as an artist, Severn longed to visit Italy; the Piazza di Spagna area where he and Keats eventually settled was known as the ‘English ghetto’ because of the many foreign artists living and studying there. Fresh from his triumph at the Royal Academy, Severn was eager to study the great Italian masters, to be inspired by the beautiful landscapes of Italy. And the gold medal allowed him to apply for a traveling fellowship – three years of artistic freedom paid for by the Royal Academy. To receive this grant, Severn needed to paint an original oil and ship it to London. Once the painting was approved by a panel of judges, he would receive the precious fellowship. Since Rome was the art capital of Europe, it made sense to travel there, and even more sense to travel with Keats. Severn had long admired the young poet, only 24 when they set out and already the published author of three books of poems. Poor Severn was torn. He regarded Keats with something approaching awe, well aware of the younger man’s talent – aware, too, that a few London friends thought he may become a rival to Shakespeare. But during the voyage Severn found Keats withdrawn and difficult to reach. The silence reminded Severn of the lack of true friendship between the men. Yet the silence was better than Keats’s sudden and unexpected outpouring of feeling when they arrived at Naples. Suddenly, Severn became aware of another reason for Keats’s mental anguish – it wasn’t simply his ill health, it was also an ill-fated love affair with a young woman in London named Fanny Brawne. Severn knew of Fanny and Keats’s flirtations with her, but he did not know that she and Keats were engaged. The engagement was known only to Fanny’s mother, who had helped nurse the poet in London. The first night in Naples found both Severn and Keats writing letters home. Severn interrupted his, to a friend named William Haslam, when Keats wished to talk again. There are oblique references in Severn’s letter of Keats’s ‘heavy grief’, but nothing more. The conversation soothed Keats but gave Severn fresh cause for concern. Keats’s own state of mind can be further guessed by reading his letter from that evening, to Charles Brown. It is clear that he was thinking only of Fanny Brawne, and she was undoubtedly the focus of his conversation with Severn. Keats’s confessions made Severn believe that the poet’s problems were caused as much by love as physical disease. This opinion was already shared by Keats’s friends and doctor, and indeed Keats himself believed it. 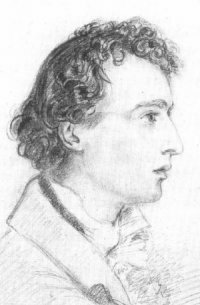 In the text of the letter to Brown, Keats had written: ‘My dear Brown, I should have had her when I was in health, and I should have remained well’. Interestingly, Keats also believed his younger brother Tom had died as much from a broken heart as consumption. The power of love in Keats’s universe was thus life-altering, and life-threatening. This belief gave Severn some optimism since heartache was not as alarming as consumption. But he was disturbed by the intensity of Keats’s feelings, and how they affected his health.